The ninth anniversary of the 9/11 attack is nearly upon us. It’s safe to assume that a huge number of truth activists will be in NYC for the 10th anniversary, so let’s make the ninth anniversary a big one in our home communities. 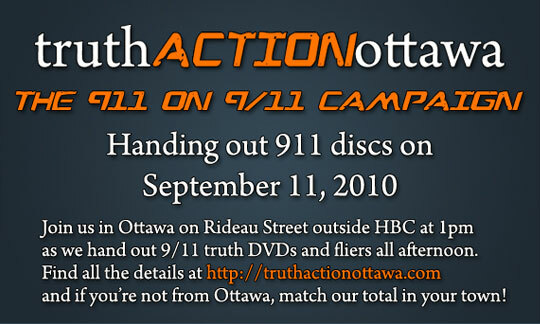 Truth Action Ottawa is producing nine hundred and eleven fliers and DVDs to hand out to members of our community on 9/11. We’re issuing the challenge to all our fellow truth groups in every community across the globe to do likewise. It can be fliers, DVDs, copies of the nanothermite paper, the new ae911truth broadsheet, or if you’re on a budget, stand with a sign on the side of a highway until at least 911 cars have seen you. Meet or exceed the 911 total, and whatever you do, make it big. If we do our job right, we can wake up a huge number of people and create a whole lot more momentum heading towards the 10th anniversary. There is a Facebook event page located here if you would like to use that network to help get the word out. Invite all the Truth Action, We Are Change, Love Police and 9/11 Truth chapters in your network to participate! If there isn’t a truth group in your area, start one! There’s no better time than now to get active! See you on the eleventh! It would be awesome to see groups from around the world step up to this challenge. Thanks Cosmos! We’re working on some more publicity for it. 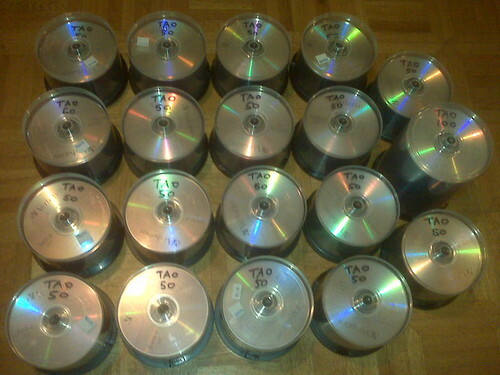 The discs are burnt, and we’re having a packaging party next week to assemble everything. Many hands make light work! I also posted it on truthaction.org at the top of the front page. Tell Mark I said hi! Get into action this 11th….